Oldknow Academy, which was the subject of an intense campaign of lies to vilify the school had been taken over by ARK Academies. More recently, Golden Hillock School, formerly a part of Park View Education Trust, has also been taken over by ARK Academies. ARK is the international charity founded and overseen by a number of UK-based, heavy-hitting hedge fund managers including Arpad Busson of EIM, Ian Wace and Paul Marshall of Marshall Wace and Aurum Funds’ Kevin Gundle. With such oversight, there isn’t a shortage of cash. According to their accounts dated August 2014, ARK had a net fund of £339 million. There is a lot of disturbing controversy surrounding ARK, or “Absolute Return for Kids”, however conspiracy theories are of no interest to me. My concern is the possible grand government orchestration which may explain the eventual takeover of Muslim-majority schools by ARK. During the peak of the hype around the Trojan Hoax allegations, the trustees of Oldknow Academy were removed. My sources state that Colin Diamond (Deputy Education Commissioner Birmingham for Department for Education) arranged the appointment of a local Jewish Councillor, Dr. Barry Henley as the chair of governors. Henley had instituted an internal hearing process after which it was allegedly concluded that the accusations against the Muslim teachers did not necessitate disciplinary sanction. It is claimed that Colin Diamond and the Department for Education did not approve of this outcome. Henley was told that “not enough progress had been made”, and ARK Academies was brought in to replace him. Clearly “progress” here refers to the number of Muslims which can be purged from the education system. 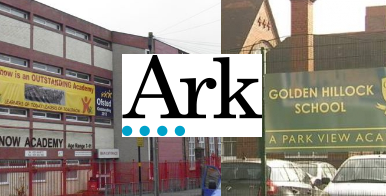 My sources in Birmingham state that the rumours of ARK taking over Golden Hillock School were circulating as early as April 2014, suggesting that the takeover by Ark was predetermined. It is also being said that the school has been at pains to explain that ARK is not an evangelical/Christian organisation. To prove this, the new head, David Gould, ferried in a van-load of Muslims to substantiate this point. In general, the parents my sources have spoken to state that the new leadership seems to be more receptive than the outgoing friend of Colin Diamond, Tony Wilson, who rudely dealt with parents. With the assumption of the school by ARK also came the removal of the Riverside Church-linked Jo Tyler. While I caste no aspersion on the integrity of the incoming individuals, there are some highly questionably reservations regarding the charity itself. Post-Trojan Hoax, the standard established by Michael Gove and his lackey Peter Clarke, is that one merely needs to articulate Islamic beliefs to undermine one’s reputation as an educationalist, be it an academy taking over schools, or a teacher. Those are some mighty Christian words dabbling in the realm of education targeting “deprived areas”. When you couple this with the fact that ARK in Birmingham has taken over schools predominantly in Muslim areas, then Clarke-ian plot orchestration barometer should start twitching. In 2009, ARK Schools launched the Graduate Teacher Programme which is accredited by the Canterbury Christ Church University. The university claims to share its values with the Church of England Foundation. The programme places successful candidates into ARK academies. In the post Gove-Clarke-Wilshaw era that we now live in, this should be enough to trigger a triple-layered government assault on ARK via Ofsted, the Department for Education and the Charity Commission. However, these aren’t Muslims we are dealing with here. We are dealing with the saviours of Muslims. There are those who are fully aware of how Ofsted has become the arm of the Department for Education. Despite the façade of outward differences, Gove and Wilshaw agree in policy. We also know that despite Nicky Morgan ostensibly fronting her role as the Education Minister, her department is being “driven from the back seat” by neocon Michael Gove, whilst key decisions are allegedly being decided on the “table of David Cameron”. However the links extend beyond this. Gove gave his stamp of approval to the academies scheme, and in 2010 the government policy began focussing on leadership. The emphasis on reforming leadership was fostered through the work of the Future Leaders Scheme. This career fast-tracking scheme was strongly endorsed by Gove, who then went to encourage its implementation in Free Schools, where it would be easier to implement. The Ark Academy chain was used to realise this. ARK was one of the three partners which established the Future Leaders Scheme. Wilshaw was once the head of one of the first academies – Mossbourne, which was lauded by Gove. It was also an ARK Academy. Wilshaw was, until November 2011 and before becoming Chief Inspector of Ofsted, an Education Director of ARK, where he shared his expertise with eight different academies. The man who ensured sudden changes in the criteria of assessment driven by the counter-extremism industry which resulted in Muslim majority schools being placed in special measures, and who is clearly ideologically-motivated like his cheerleader Michael Gove, also happens to have deep links with the government, and the very Academy chain which has now taken two of the aforementioned schools. A coincidence? I’ll let the reader decide that. In a previous article, I wrote about how the Zionist lobbies, corporations and neoconservatives were wielding their influence on politics which affected each and every one of us: the triumvirate of influence. Since then there have been further reports about the Conservative party hosting private dinners for the glitterati: 45 wealthy businessmen and hedge fund bosses, who have since the last election donated more than £40 million to the party, and who are helping fund the party in marginal seats that could swing the election outcome. Democracy is for sale, so to speak. With the discourse shifting to tax-avoidance, a political punch-up in the Commons ensued. Ed Miliband claimed that Stanley Fink had used a Swedish account to circumvent taxes. Fink then threatened Miliband to make the comments outside the Commons again where he could be subjected to a libel law suit. The following day Fink, rather embarrassingly, ended up confirming Miliband’s claims, stating that he engaged in “vanilla tax avoidance” measures. Who is Fink? Fink is a major donor of the Conservative Party having pumped £2.62 million into their coffers. According to the Financial Times, he is “known as the ‘godfather’ of the UK hedge fund industry”. Fink is a Zionist, and was described as a “loyal donor” of the Henry Jackson Society-linked “Just Journalism” project, which sought to attack those who exposed Zionist war crimes. Just Journalism had been endorsed by the terrorist-inspiring Melanie Phillips, as well as other neoconservative blogs like Harry’s Place. In the past (between 2005 and 2007) his donations have also reached the hawkish neocon Liam Fox, who’s neoconservative, pro-Zionist, Atlantic Bridge “charity” (also run by Michael Gove), was exposed in a democracy-undermining scandal. “The Jewish Leadership Council, whose members also include pro-Israel Tory funders such as Lord Stanley Fink, and Tony Blair’s controversial man in Israel Lord Michael Levy, have taken it upon themselves to vigorously defend Israeli leaders from the principles of universal jurisdiction – which proves a great example of how influential the lobby is ,how intent the lobby is on insulating Israel from legal redress, and exactly why British voters should be wary of how much money the lobby is pumping into our elections. I can hear the questions being raised at this juncture: what relevance does this all have with little ol’ Oldknow and Golden Hillock Schools? Fink became the chair of ARK in 2009 and according to the latest accounts I have seen, is currently a director of the charity. My sources in Birmingham have informed me that ARK is aggressively pushing to takeover more schools in Birmingham, further removing control of schools from the Local Authority. This is concerning in light of the above as there are questions which need answering. Is it a coincidence that the very people who have pushed a business model of education in the past have also had a pivotal hand in smearing Muslims over the past year for the faux school takeover plots? Is it the case, like the alleged decision for Muslim teachers to be circumvented of the normal disciplinary process to ensure their removal, that the ARK control of Academies in Birmingham was facilitated at the “table of Cameron”? Was it influenced by Zionist money being funnelled in to the Conservative party, with the donor of the money being linked to Wilshaw and Gove? Whatever the case, ARK has the toxic blend of Zionism, corporations and neoconservatism finger-printed all over it. This entry was tagged Absolute Return for Kids, Academies, ARK, ARK and Zionists, ARK Christianity, Atlantic Bridge, charity commission, Colin Diamond, Creflo Dollar ministries, Department for Education, Free Schools, Golden Hillock school, Henry Jackson Society, Jewish Leadership Council, Just Journalism, Liam Fox, Melanie Phillips, Michael Gove, Michael Wilshaw, neocons, neoconservatism, ofsted, Oldknow Academy, Park View Trust, Paul Marshall, Peter Clarke, Stanley Fink, table of David Cameron, tax avoidance, Tony Wilson, zionism, Zionist. Bookmark the permalink. An interesting note to this is that the local governing body at Golden Hillock (the majority of whom are Muslim) was given no notice of the decision to have Ark take over the school and had no opportunity to influence this decision. Thank you for this. I will investigate this further.